After a vacation or holiday, you may have many photos for sharing with family. It sounds a good idea to display photos on big – screen TV with music and transitions. Especially, there are many people in the room. Showcase your photos on TV and share your best moments with friends and family. You can view photos on TV in two different ways: 1. Make a photo slideshow DVD then play it on TV with a DVD player. 2. Mirror your photos to TV with iPad. 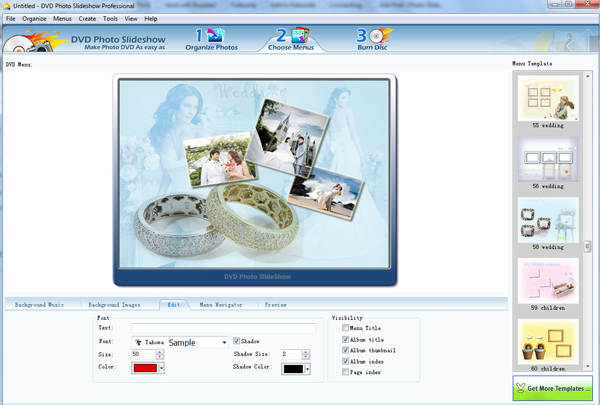 To create a slideshow DVD, you can try to use DVD Photo Slideshow, which is a professional slideshow maker. It enables you to create a slideshow with music, transitions, pan&zoom effects, text, subtitles, theme and so forth, then burn the slideshow to DVD with DVD menu template. With DVD Photo Slideshow, you can easily burn your photos onto slideshow DVDs in three simple steps: Organize Photos, Choose Menus and Burn Disc. You do not need any technical skills to use it. Import your photos into the program, then you can burn it onto DVD. So simple? Yes! Download Free Version to try. You can play the slideshow DVDs made by DVD Photo Slideshow in your DVD player or TV with a DVD player. It can showcase your photos in high quality. Also it supports NTSC and PAL TV system. After finishing a slideshow, tap Export icon and play Slideshow on HDTV via Airplay or cable. With the Apple TV(2nd or 3rd generation), you can play finished slideshow to HDTV via Airplay. Or you can connect your iPad to TV with Apple Digital AV Adapter and HDMI cable, and play the slideshow to TV for viewing your photos with music. This entry was posted in Best ipad slideshow app, DVD Photo Slideshow and tagged airplay photo slideshow on tv, play photo dvd on tv, view photo slideshow on tv, watch photos on tv on December 21, 2012 by Sarah Jablich.